Anonymity is one of the tools that I struggle with. I mean STRUGGLE. It’s because I don’t believe that anonymity is possible when you’re fat. Sure, bulimics might be able to hide their disease by clinging to a healthy weight by their fingernails using purging methods, but for us binge eaters and anorexics, it’s impossible to hide the fact that we have a problem. People can LITERALLY SEE that we have a problem. No amount of empire waists and black leggings can hide it. No amount of baggy sweatshirts can hide it. EVERYONE knows that we are struggling with food, either by eating too much or restricting too much. The truth is, even alcoholics can’t hide it. They might think that they can hide the fact that they have a problem, but they can’t. WE ALL KNOW YOU’RE AN ALCOHOLIC! You’re not hiding it, no matter how much you think you are. The “Anonymous” in Overeaters Anonymous seems to be the only thing that goes against the program. We have to accept that we have a problem and that our lives are unmanageable. Pretending that we are anonymous seems to go against every bit of that. It seems to hide the fact that we have the problem, when the program tells us that we need to OWN it. We need to FULLY accept the fact that we have a DISEASE of the mind that makes us eat too much, purge, or restrict. Whatever form the disease takes, it is a problem with food and it is impossible to hide it, so why are we pretending we can? Even when we are in recovery, we can’t hide it. There are scars all over our bodies from it. 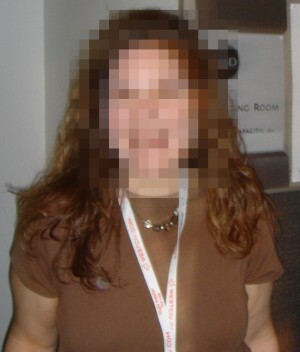 If you look at that photo above, you can SEE the scars from being overweight, even though my face is blurred. I was at 150 lbs. when that photo was taken and I had lost approximately 80 pounds at that point. If you look at my arms, you can see the extra skin, hanging flaccid over my elbows. Even at an almost healthy weight, I couldn’t hide the fact that I have a problem with food. I DO understand confidence. When someone shares in a OA meeting, they might say things that are sensitive. It’s no one’s business what is said in our meetings and we expect you to keep our confidence. But being closed-mouth about our shares is a FAR cry from anonymity. Holding each other’s confidence is possible, but true anonymity is NOT. We live in a computer age, where cameras are everywhere and corporations have access to our Facebook account information for their own perusal. There is no such thing as anonymity in this world and clinging to that idea not only is impossible, but I don’t believe it is helpful for recovery. Maybe I will change my mind in the future, but for now, it’s the tool of recovery I believe should be scraped and replaced with a spiritual practice.